I have a confession – although I love sewing and constructing, I hesitate to call myself a seamstress, because I am not good at making clothes. However I have decided to challenge myself, and attempt to make a top for myself to wear on my trip (this time next week I will either be in Byron Bay or en route and at least in the vicinity!). A few weeks ago I was reading a blog (and if I could remember which one it would have saved me hours of fruitless searching on the net) and the blogger was showing a photo of a tunic top that she had made – and shared that she is not normally great at making clothes. Having identified fully with this statement I took note of the top – but forgot to pin it, favourite it etc. To cut a long story short, on Sunday I finally remembered that it is the Tova Tunic from Wiksten, so promptly ordered the pattern. After a few very helpful email exchanges I received the pattern yesterday (I suspect my paypal email address had filtered it out). Last night I printed it and did the jigsaw puzzle to fit the pattern together. And tonight I cut it out and started sewing. I had to stop when my overlocker blew a frizter valve – but I managed to repair the overlocker, so full steam ahead tomorrow to finish it. I am happy with it so far, so here is a dodgy nighttime shot of the work in progress! If it all works out then I will probably make another one in a different fabric – but I thought that this bright orange could work well – and as a bonus will help me to stand out in the crowd at the music festival so my friends can find me!! I have a bunch of other things I am keen to tackle – my girls have both asked for Kindle covers (they both emailed me from their bedroom to put in an ‘order’ – I am not sure whether to be amused or horrified), a lovely work colleague has ordered a retro styled apron, and I would like another top and skirt to take away to Bluesfest, plus a bag to carry my money, glasses, etc at Bluesfest (in a futile attempt to save my back by lightening the load – which is futile given that I will still stand/dance etc for hours at a time). But given that there is only a week until I am on the road I have no idea what will actually be achieved! I will keep you informed no doubt! 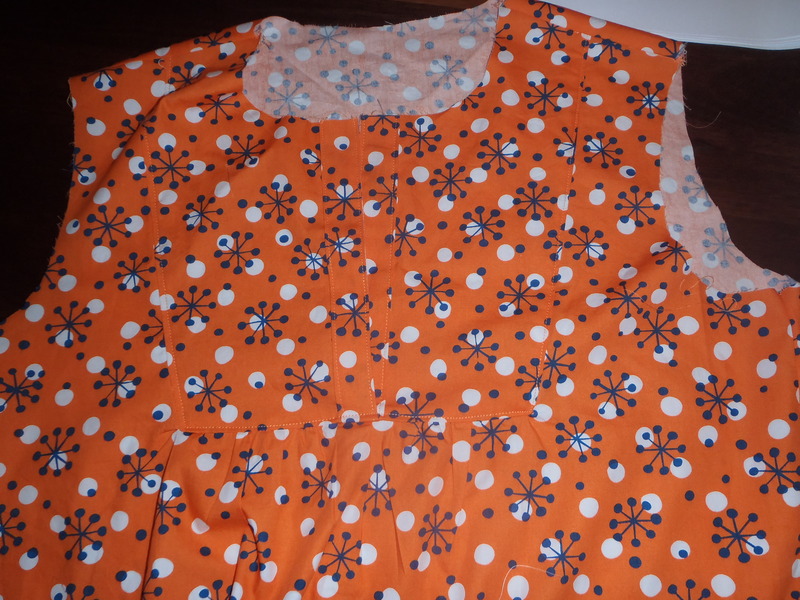 This entry was posted in Uncategorized and tagged bluesfest, overlocker, plans, serger, Sewing, Tova tunic on March 20, 2013 by a little bird made me.